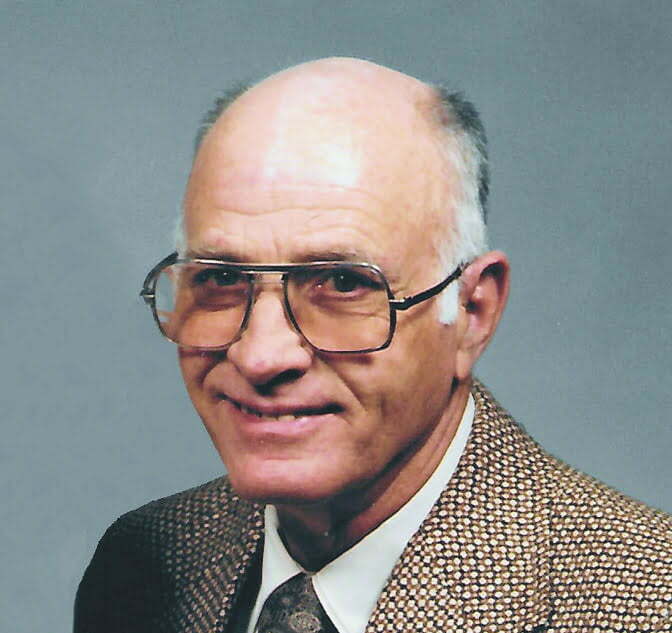 Fred Calaway Hill, 92, passed away peacefully on May 23 in Albuquerque. Fred was born in Venus, N.M. (north of Edgewood), on March 14, 1925 to Joe Benjamin and Mae Madole Hill. He was raised in Edgewood and in downtown Albuquerque and graduated from Albuquerque High School in 1943. Following high school Fred joined the U.S. Coast Guard and served as ship’s cook. He married his high school sweetheart Betty Gloss on March 3, 1945, and then returned to Coast Guard service in the North Pacific. Fred had a strong artistic gift and attended the Art Institute of Chicago before choosing a career as a home builder, which combined his eye for design with hands on construction skills. He enjoyed a long career building custom homes throughout Albuquerque and Edgewood. He served as President of the Albuquerque Home Builders Association in the 1960s. Fred and Betty were avid square dancers and liked to travel. He enjoyed exercising his artistic talent in creating pastels and watercolors. Fred also enjoyed playing bridge with his high school buddies, Warren Wylie and Elwin Schaefer. He was preceded in death by his parents and seven brothers and sisters; J. Howard Hill, Lois Sievert, Don Hill, Alta Mae Jensen, Chester Hill, Maxine Hopping, and Kenneth Hill; his wife of 60 years, Betty Gloss Hill, passed away in 2005. He is survived by his three children and their spouses, Kayreen and Gordon Sargent of Tijeras, Kreg Hill and Bill Christensen of Palm Springs, California, and Karl Hill and Christina Lui of Boulder, Colorado, and by many other family members and friends. The family very much appreciates the loving care rendered by the caring staff at BeeHive Homes Assisted Living and Compassus Hospice. A graveside service was held at the Mountainview Cemetery in Moriarty for the immediate family. A celebration of life gathering will be announced and held at a later date. Memorials may be made to the Presbyterian Healthcare Foundation, Hospice Program, PO Box 26666 Albuquerque, NM 87125-6666. Those wishing to sign Fred’s guestbook may do so at his Celebration of Life gathering.